My husband loves pasta, so I'm always whipping up some type of pasta dish for him. I like to find new shapes and mix it up. Orecchiette isn't a new shape, but I don't often buy it. The word orecchiette means "little ears" in Italian, so that's why I'm naming this pasta Little Ears Pasta. 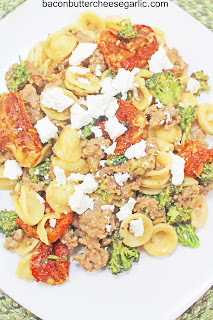 I could have named it by its ingredients, but I think pasta with Italian sausage, baby broccoli, sun-dried tomatoes and ricotta salata is a bit long. So Little Ears Pasta it is! What's ricotta salata, you ask? It's an Italian crumbling cheese made from sheep's milk. It's actually really tasty and a bit salty, which I love. It's similar to the Mexican cheese cotija. You could sub shaved Parmesan or feta cheese or really just whatever you want to do. You're eating it, so make it yours. This pasta is really easy and quick and (wait for it) darn tasty! NOTES: This isn't a real saucy pasta. It's a light coating of sauce. Also, as you can see from the picture, I didn't chop the sun-dried tomatoes which made it kind of a lot to bite into. I would suggest you at least cut them in half. Meanwhile, drizzle some olive oil into a large skillet and heat it to medium high. Cook the shallots for about a minute. Watch them carefully and stir frequently because they will burn quickly. Add in the Italian sausage and garlic. Cook and break up the sausage until it's cooked through. Add the wine to the pan and scrape up any browned bits. Add the broccoli, chicken stock, tomato paste, cream, sun-dried tomatoes, and season with salt and pepper. Reduce the heat to medium and cover the skillet. Cook until the broccoli is soft and the sauce is slightly thickened. Drain the pasta and return the pasta to the hot pot. Add the sausage mixture to the pasta and stir in the ricotta salata and serve. Well, I wish I had a funny story for you today. I got home from work late and still need to cook dinner. Don't you hate those frazzled days where you feel like you're in a hurry? Well, here's a relatively quick and hearty meal. 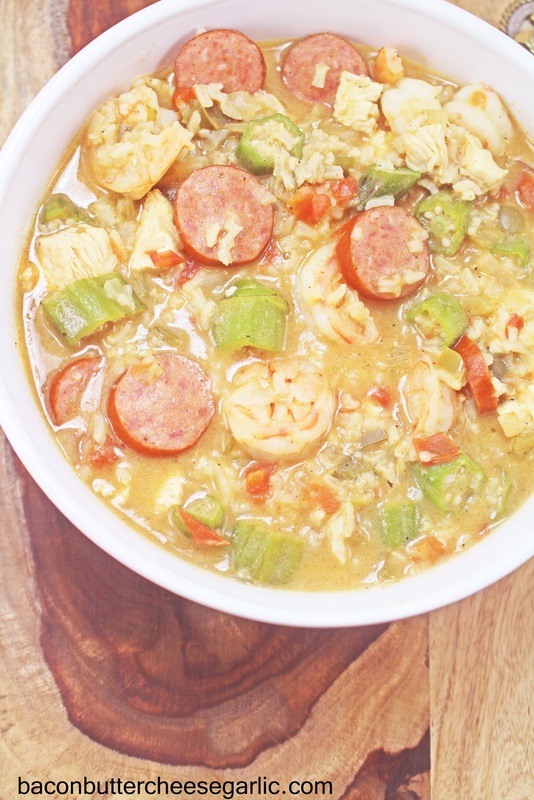 This Jambalaya only takes about 10-15 minutes to prep and about 35 minutes to cook. It's great for a cold night since it's so hearty. And it's darn tasty! In a large pot or dutch oven, drizzle in some olive oil and turn the heat to medium high. Cook the bell pepper, onion, and celery until they are tender. Add in the garlic, tomatoes, bay leaves, Worcestershire sauce, Cajun seasoning, rice, and chicken stock. Turn the heat to medium. Cook until the rice is tender, about 15 minutes. Add in the shrimp, chicken, sausage, okra, and hot sauce to taste. Cook until the chicken and shrimp are done, about 10 minutes, and the soup is thick, like a stew. Remember to remove the bay leaves before serving. Serve with more hot sauce, if desired. My husband and I are huge fans of the TV show Top Chef. Really, we are fans of a lot of cooking competition shows. Anyway, one of the contestants awhile back is a man from Italy named Fabio Viviani. He started working in Italy at the age of 11 and became a sous chef by the time he was 16. Apparently he's a very ambitious person. He moved to the United States and has opened several restaurants, to include a restaurant called Siena Tavern in Chicago. Siena is a city in Tuscany, Italy, and he comes from Florence, Italy, which is also in the Tuscany region. Anywho, one of the dishes at that restaurant is a gnocchi dish. It's only called "Gnocchi" on the menu and the description is truffle cream, fried sage, and crispy pancetta. I added Italian sausage to make this a little meatier. And let's talk about truffles for a second. If you know what they are, then you know they are extremely expensive. I can't get them where I live, so I settled on second best. I found a really small jar of truffle cream at a store called Spec's. It's a 2.8 ounce bottle that I paid about $15 for. But, if you've had truffles, you'll know that the flavor is so amazing and indescribable. Now, I've never been to that restaurant, nor have I been to Chicago. But I thought I'd give my best shot at recreating this gnocchi. I'm calling it Sienese Gnocchi for the region that he came from. And you know what, it was really darn tasty! Enjoy! Pour about 1/4 C olive oil into a small skillet and heat it to medium high heat. Separate the sage leaves from the stems and fry them in batches for a couple of minutes until they are crisp. Don't walk away from them because they will burn quickly. They will turn dark, almost black. Drain them on a paper towel and set them aside. Cook the pancetta (or bacon) in a skillet until it's crispy. Drain it on a paper towel. Add in the butter and melt it. Cook the shallots in the butter, stirring frequently, until they are soft. Add in the Italian sausage. Break the sausage up with a wooden spoon. I left mine in bigger chunks so it was almost like tiny meatballs. Cook the sausage until it's done. Deglaze the pan with the wine and scrape up any browned bits. Drop the gnocchi in the boiling water now and cook it according to package directions. Add the garlic to the sausage and cook and stir abour 30 seconds. 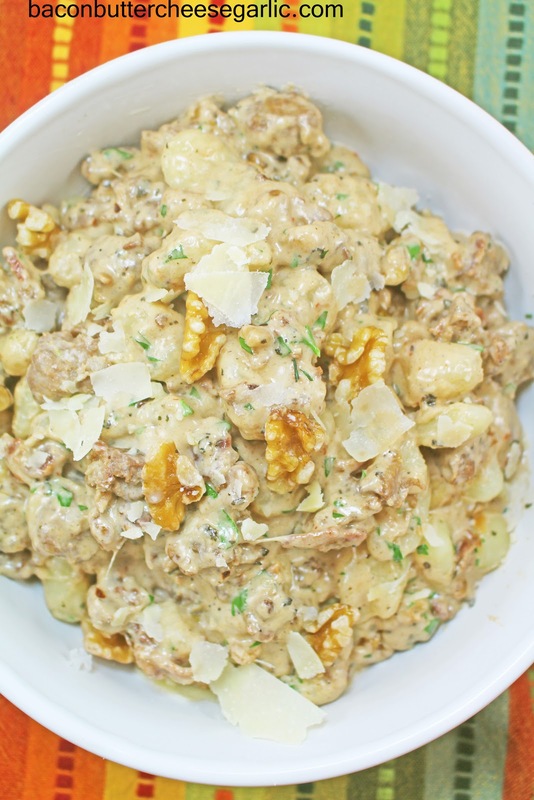 Add the walnuts, cream, truffle cream, pancetta (or bacon), and chili flakes to the sausage. Bring it to a slight bubble. Add the Parmesan cheese to the sauce. Crumble the sage leaves into the sauce. Stir the sauce until the cheese is melted. Remove it from the heat. Drain the gnocchi and add it to the sauce along with the parsley. 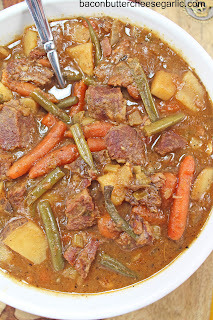 Recently I came across some tips for perfect beef stew. Have you ever spent the day cooking a beef stew, either on the stove or in a crockpot, only to find that the meat is tough? That's very disappointing, I know. I've had that happen a lot. Or maybe the stew part is too thick or too runny? Or maybe that the beef lacks in flavor? I've had all of those mistakes, but I've found the cure for all of those problems. First off, the only meat to use here is a chuck roast. Sure, you can try fancier cuts of meat, but they just don't break down the same way as a chuck roast. You don't want dry, tough meat in this comfort food. Trust me on this one. I've tried all kinds of cuts of meat and failed miserably. Next, the most important way to add flavor to your stew is by searing the meat first and then deglazing the pan with wine. Searing the meat gives it more flavor, and deglazing the pan gets up all the little good bits left in the pot. But be sure to sear in batches or you won't get that caramelization since the heat of the pan will decrease too much if you put too much in. Lastly, there's no need to make a roux or add flour to the stew. By coating the meat with cornstarch before searing it, it helps get the right thickness. Also, turning the heat up during the last hour of cooking and stirring frequently gets the starch out of the potatoes more and helps thicken up the stew too. I made this Crockpot Beef Stew last night, and it was the best I've ever had. Enjoy! NOTES: I prepped all of the ingredients and seared the meat the night before since I leave for work early. The next morning, I just threw it all in and let it go. I turned the crockpot on at 7:30 and let it go until about 6:30 at night, but it will probably cook in about 8-9 hours. Since crockpots are sealed and don't allow any escape of liquid or evaporation, the 2 1/2 C beef stock is plenty, trust me. Don't be worried that the stock doesn't fill up the pot or cover anything. The meat will give off enough juice for this. Don't salt the meat until it goes into the pan to sear. Salting it early will draw out the moisture and make the meat dry. First off, get a pan, preferably cast iron, screaming hot. Mix the beef with the cornstarch. When the pan is really really hot, drizzle in some olive oil. Sear the meat in batches (mine took three batches) for several minutes on most sides to really brown the meat. Don't turn it until it's browned. Also, season the meat generously with salt and pepper only when it's in the pan. Add in more olive oil if necessary between batches. When all of the meat is seared, pour the red wine into the pan and whisk, scraping up any browned bits left behind. Remove the pan from the heat. Put all of the ingredients (including whatever red wine is left in the pan) into a crockpot and turn it on low. You can add salt and pepper in as well, if desired. Cook the stew for about 8-9 hours. During the last hour, find the bay leaves and thyme springs and remove them. Turn the crockpot up to high and stir frequently to break up the potatoes a bit and thicken the stew. Serve the stew with a nice hunk of cornbread. Recently one of my followers on Facebook requested that I make some Hashbrown Nests. 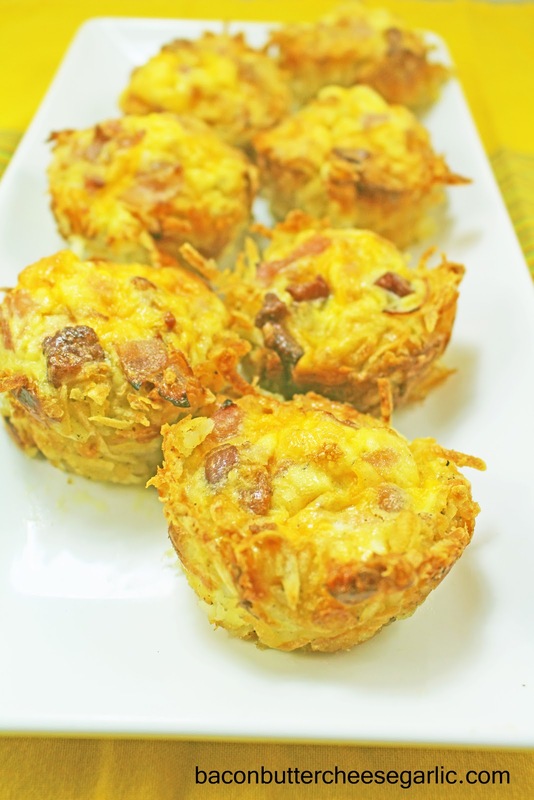 It's almost like mini quiches but with a hashbrown crust. I went simple on the filling, but you could absolutely customize these and add things like onions, spinach, peppers, you name it. They are easy and darn tasty! Preheat the oven to 400 degrees. Squeeze as much water out of the hashbrowns as you can in a towel. By hand, mix the hashbrowns with the oil, 1/2 C cheese, and salt and pepper. Spray a 12-cup muffin tin generously with nonstick spray. Press the hashbrown filling into each tin firmly, being sure to come up over the top a bit since they will shrink. Bake the crusts for 30 minutes. Meanwhile, prepare whatever filling ingredients you like. Whisk the eggs together with the cream and salt and pepper. Stir in the cheese, bacon, and ham (or other ingredients). Pour the filling into the cooked crusts. Bake the nests for 20-25 minutes or until the eggs are completely set in the middle.